Microwave water for 30 seconds until warm, about 110°F. Pour water in a large bowl and add yeast, stirring to dissolve. Cook potatoes until soft. Mash until smooth. Add to mixture in large bowl, along with butter, honey, egg, salt, whole wheat flour and chopped sage. Mix with spatula until smooth. Stir in enough white bread flour to form a soft dough. Turn dough onto a floured surface. Dough will be very sticky. Continue to add bread flour while kneading until dough is tacky but does not immediately stick to fingers. Knead about 10 minutes until elastic. Place in clean bowl spraying with cooking spray; turn to coat. Cover and let rise one hour or until doubled in bulk. Punch dough down. Divide in half and shape both halves into oval-shaped loaves. Place in two 9 x 5-inch loaf pans sprayed with cooking spray. Cover and let rise about 30 minutes or until doubled in bulk. Bake at 375°F for 30-35 minutes or until golden brown and about 190°F inside (use a thermometer to test). Check bread after 10 minutes into baking; if tops are getting too brown, cover loosely with tin foil. Remove pans from oven and cool completely on wire rack. When I was little, I hated the taste of sweet potatoes. They seemed bland to me, and stringy, and I was wary of their stark orange color (my discerning palate as a youngster only preferred foods of the beige color). Once I started getting older and developed a wider range of taste buds (and discovered the fabulous brown sugar/butter combination), I always asked for sweet potatoes over the regular ones. Now, they're more a part of my diet than the boring old russets. Sometimes, though, I get fed up with always accompanying my sweet potato with the intense sweetness of brown sugar and butter, and I long for a more savory, sophisticated taste alongside the starchy orange vegetable. 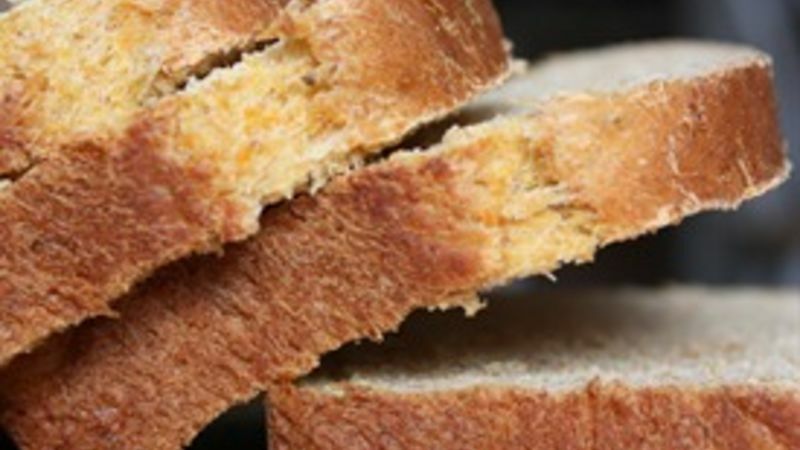 Recently I've also been contemplating how to make traditional sandwich bread with a little more pizzazz, instead of continuing to wedge a few of my favorite ingredients between two tasteless slabs. That's when Sweet Potato & Sage Bread came into the picture. In case you haven't noticed by now, I'm a big fan of coupling two ingredients into one loaf. I like simplicity, so I tend to steer clear of multiple main ingredients if I can help it. I also love the sweet and savory combo, though this recipe leans more to the savory side. What's nice about this particular recipe, though, is you can choose really any partner to go along with the sweet potato - thyme, rosemary, brown sugar, or let it stand alone. I chose sage based on a yummy sweet potato-brown butter-sage pasta dish my husband made for Valentine's Day. The melded flavors just stuck with me, and I've been curious to implement them into a different meal ever since. This bread is great for those who struggle with yeast breads not rising -- to be honest, I'm not sure what ingredient makes this loaf so unfussy, but whatever it is, it almost always rises into a very tall loaf. Perfect for sandwich bread. Use the Sweet Potato & Sage loaf for your favorite grilled cheese recipe, or slather on some tasty cream cheese. Your own discerning palate will thank you for it.